6100 Series Environmentally Sealed Switches are designed for applications where high reliability is required in a high or low temperature environment. Combining long life and precise action, this switch is used in a wide variety of commercial and military aircraft and space applications. These switches can perform such functions as indication for Interlocks, landing gear position, valve position and throttle control. Military applications include brake lights on military vehicles, gear shift indicator for tanks and other applications where a resiliently sealed, high reliability switch is required. Incorporating an elastomer seal, which enables high sensitivity and low operating pressure, the switch has a maximum leak rate of 1X10 -6 atm cc/sec. Fine silver contacts are standard and gold alloy or platinum contacts are also available. Electrical and mechanical life are conservatively rated at 100,000 operations. Also available in our 6100 series environmentally sealed switches is an ultra high temperature, non-sealed switch with a range of -65F to +700 F (-54 C to + 371 C). 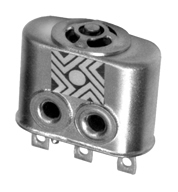 6100 series environmentally sealed switches are available in a wide variety of actuator assemblies. Typical assemblies include pushbutton, toggle, leaf actuators, and roller leaf assemblies. HSI can also provide custom assemblies to meet specific operational requirements. Dielectric Withstanding Voltage 1000V rms at sea level for 1 minute or 1250V rms for 1 second with maximum leakage current 0.5 milliamperes. Can be supplied to meet 1500V rms withstand voltage with reduction life.